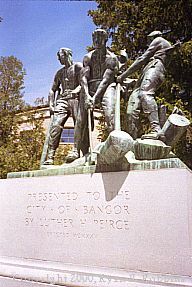 "The River Drivers," a sculpture by Charles Tefft next to the Bangor Public Library on Harlow Street, commemorates Bangor's claim to fame as the Lumber Capital of the World in the 1800s. Bangor is a humble little city in central Maine, and its history is no different. In the late 1500s David Ingram became the first known European to sail up the Penobscot River to what is now Bangor. When Ingram returned to Europe, he reported finding a wealthy city whose streets were lined with gold and tall buildings with casements of silver. Excited at Ingram's tale, some Europeans believed Ingram had discovered Norumbega, the lost city of gold. A few years later, in 1604, Samuel de Champlain sailed into Penobscot Bay, up the Penobscot River, and anchored at the mouth of what is now the Kenduskeag Stream. Champlain didn't find a wealthy city, of course. Instead, he found the Tarratines, an American Indian tribe. The Tarrantines and Europeans engaged in fur trading. It wasn’t until 1769, though, that Jacob Buswell, his wife, and nine children, from Salisbury, Mass., became the first Europeans to settle at the mouth of the Kenduskeag Stream in what was then known as Kadesquit by the American Indians. A year later, the Buswells were joined by Buswell’s brother Stephen and his wife, and by Caleb Goodwin, his wife, and eight children. During the next several years, the Europeans would alter the name of the plantation from Kadesquit to Condeskeag to Conduskeag to, finally, Kenduskeag. 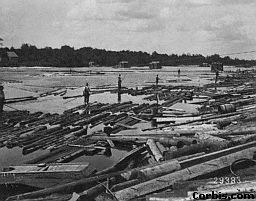 Accounts vary on how many settlers were at the plantation –- some sources say there were as many as 576 while most others say there were between 200 and 300 -– but in 1791 the settlers decided to incorporate themselves as a town. Because Maine was part of Massachusetts at the time, the settlers had to petition the Massachusetts General Court to become incorporated. The Rev. Seth Noble, who had arrived in 1786 from Wakefield, Mass., convinced his neighbors they should call their town Sunbury. Noble’s neighbors gave him the task of going to Boston to deliver the town's petition. While waiting to present the petition in Boston, Noble -- an organist and composer -- began whistling one of his favorite tunes: "Bangor," a Welsh hymn written by Tans'ur. In Welsh, "Bangor" means "high choir." In Celtic, "Bangor" means "the white choir." When a court official asked Noble what his town wanted to be called, Noble was caught off guard. Daydreaming, perhaps, Noble thought he'd been asked the name of the tune he'd been whistling. So instead of saying "Sunbury," he said "Bangor." And Bangor it was. On Feb. 25, 1791, the General Court approved Bangor, not Sunbury, for incorporation. Historians don't know why Noble didn't correct the court. Perhaps he decided the name of one of his favorite tunes sounded better than Sunbury. The first sawmill in Bangor was built in 1772. It marked the beginning of a century of dominance by Bangor in the world lumber industry. In the mid 1830s, Bangor was home to more than 300 sawmills, earning the city the undisputed title "Lumber Capital of the World." Lumberjacks harvested the northern Maine woods and sent their logs down the Penobscot River where they were picked up by runners in Bangor. Pictures from the era show Penobscot River swollen from shore to shore with logs; people were literally able to walk from one shore to the other! After the Bangor mills processed the lumber, some of the lumber was then sent farther down the Penobscot to Winterport and Belfast where some of the world's finest schooners were built. Bangor's prosperity in the lumber industry began to fade in the late 1800s, though, as Americans began to settle farther west and harvest trees in other forest-rich states such as Minnesota and Oregon. By the end of the century the city began to lose its mills. Today, there are no mills in Bangor. 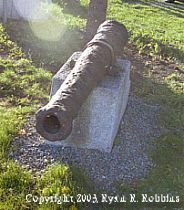 This cannon on the Bangor waterfront is one of several recovered from the Penobscot River. It is from an American ship scuttled in the Revolutionary War. Bangor and the Penobscot River saw their share of battles in the Revolutionary War and in the War of 1812. In 1779 during the Revolutionary War the British navy took control of Castine using only three warships and began building a fort. The Americans sent 19 warships and 24 troop ships carrying about 1,000 men to Castine to oust the British, who countered by sending three more warships and four transport ships. Despite outnumbering the British, American Commodore Dudley Saltonstall ordered his men to flee up the Penobscot River after he and his men reached Castine on July 24. American ground troops, led by Paul Revere, abandoned their ships near Bangor and fled into the Maine woods, headed to the Augusta area. The British burned American ships in Winterport, about 15 miles from Bangor, leaving 20 ships to escape to the mouth of the Kenduskeag Stream in Bangor. Of the 20 ships that remained, the Americans scuttled 10. Saltonstall was court-martialed for cowardice. Thirty-five years later, in 1814, the British returned in the War of 1812 and hammered American forces in the Battle of Hampden, which borders Bangor to the south, before moving on to Bangor and forcing its selectmen to surrender unconditionally. A thick fog crept through the Penobscot Valley as militiamen from the Greater Bangor area waited for the British on Sept. 3, 1814. When the Americans heard the British coming sometime between 7 a.m. and 8 a.m., they began firing their guns. But this time the British clearly had the upper hand, using two warships in the Penobscot to bombard American troops on land. Once again, the British chased the Americans to Bangor. 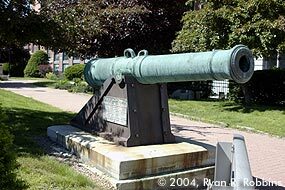 Although Bangor has no direct connection to the Spanish-American War, the shield and scroll of the Battleship Maine is on display at Davenport Park while this cannon from a Spanish galleon is on display at Kenduskeag Parkway, downtown between State and Central streets. With the bond and the frightened Americans' promise to deliver the unfinished ships, the British floated the seaworthy ships into the middle of the Penobscot and set ablaze all but two ships, one brig, six schooners, and three sloops. They then took the remaining ships, horses and cattle back to their post in Castine, which they occupied until April 26, 1815, when they left for Canada. The British didn't stay longer than 30 hours because in the midst of celebrating their victory with rum they became drunk and in danger of becoming vulnerable, according to one account of the British occupation. "There stands the city of Bangor, 50 miles up the Penobscot at the head of navigation, the principal lumber depot on this continent, like a star on the edge of night, still hewing at the forests of which it is built." Even today, Bangor is indeed a refreshing sight after traveling either up U.S. Route 1A or Interstate 95 (not that other towns and cities along the way aren't interesting in their own right). After passing through Waterville on I-95, Bangor -- an hour away -- breaks the monotony of the interstate that's enough to lull anyone to sleep, especially at night. Today, Bangor is known throughout Maine as the Queen City, although no one knows the origin of the title. Lights on the banister atop the Thomas Hill Standpipe are often referred to as the city's crown jewels. For a closer look at some of Bangor's history, check out Bangor In Focus.